That was a really good joke, congratulations! Evil and funny, I think that sums it up. Well done admins, that was a genius prank. Nice one though, for the effort put in. It was me and this world and a broken dream. I tecided to just come back here after a year of break and that what was waiting me My heart totally stoped beating and I lost my mind. Glad it was a joke. Now I know not to take breaks from this fiction ! You admins are truly genius. That was an inspired April Fool's prank, definitely the best one anyone played on me all day. Even though I knew it was a joke, I kept freaking out whenever I accessed "Twilight Fanatics"
And what's nice about it was that it really showed how interest in Roswell hasn't waned after all these years. That was joke! Holy crap! I really thought it was serious I was like really sad and was thinking of saving my favorite stories and never coming back. I like Twilight and I have all the books but I love Roswell and I totally felt like I was betraying it. Thank God you changed it back! It was a really good joke but please don't so I'd again! 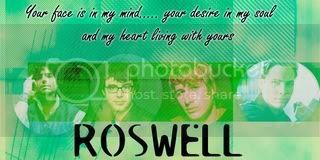 I got up depressed this morning and after going to a checklist of why I felt that way I realized it was because I was loosing Roswell Fanatics! I went to work and when I opened the site and saw my familiar, black background, I laughed out loud! You really got us! I hate you! No, I really, really love you but yesterday .... let's say I am going to pay attention to my Grandma's teachings: if you cannot say something nice about somebody, don't say anything at all!"